Given a Binary Tree, print the diagnol traversal of the binary tree. The task is to complete the method which takes 1 argument, root of Binary Tree. The struct Node has a data part which stores the data, pointer to left child and pointer to right child. The function should print out the diagonal traversal of the binary tree. There are two test casess. 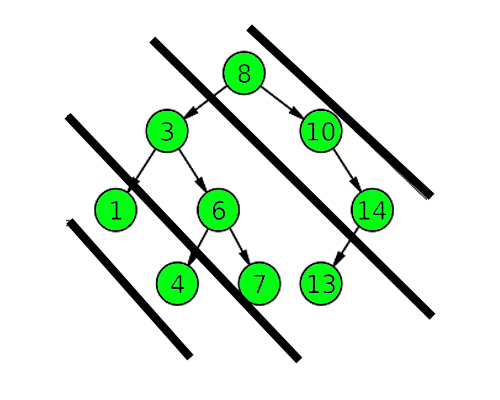 First case represents a tree with 3 nodes and 2 edges where root is 1, left child of 1 is 3 and right child of 1 is 2. 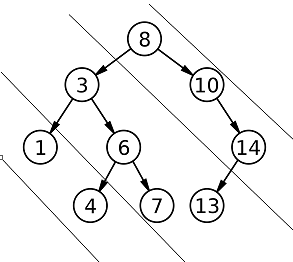 Second test case represents a tree with 4 edges and 5 nodes.